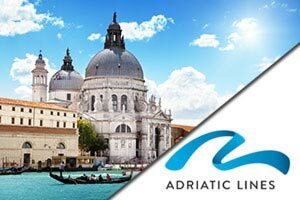 M/S Adriatic Queen is classified 5* category, completely renovated in 2017 with latest state-of-the-art equipment and amenities. It is 115 ft long, 36 ft wide, with cruising speed of 10 NM. Maximum capacity is 30 passengers in 15 cabins, all fully air-conditioned, with queen-size or twin beds, cupboard, cabinet and window or porthole, bathroom with shower, toilette and wash basin. There is free wireless internet access (Wi-Fi). The ship features fully air-conditioned salon-restaurant with bar and LCD TV. Large lounging sun deck has a jacuzzi fitting up to 6 people, and provides sun-shade cover and deck-beds for all passengers. The ship has a rear access platform to the sea as well as ladders for easy access to the water.